Work is being carried out to ensure the survival of a species of herbal plant in Cornwall. Charities Plantlife and the Cornwall Wildlife Trust have been clearing scrub from Treworder Woods near Wadebridge to protect the St John's Wort plant. The site, which is the only one in the county where the plant grows, is being threatened by invasive scrub. The herb, extracted from the yellow star-shaped flowers, has been used for centuries as a medicine for stress. A spokesman for the Cornwall Wildlife Trust said it is a rare plant which must be saved. Ian Bennallick, who records plant life for the trust, told BBC News: "It was only fairly recently recorded in the early 70s because there wasn't much access to the site, although there's a very old record in the 1800s for Cape Cornwall. "It actually grows around the coast in other sites around the world, such as western Europe, the Channel Islands and parts of France and Spain." 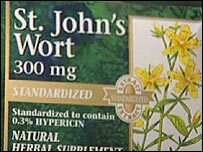 Mr Bennallick said the region's best population of St John's Wort is in the Teign Valley in Devon. Many people believe the herb is an effective treatment for people suffering from mild to moderate depression.